Latika Chhabra is currently working for the Civil Service on the HMRC Tax Professional Graduate Scheme. She graduated in 2018 with a BA in Politics and Middle Eastern Studies from the University of Exeter, Streatham Campus. Having studied Politics and Middle Eastern Studies during my time at University I’ve always been interested in working in policy. I heard about the Civil Service Summer Diversity Internship Programme when some Exeter alumni, who joined the Civil Service through the fast stream graduate programme, visited a University Careers Fair. I managed to secure a place on the programme for the summer after my Second Year at University, and was placed with the Behaviour Insights and Research Team in HM Revenue and Customs. 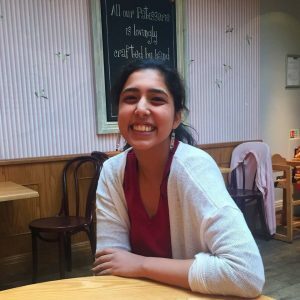 Whilst this was a daunting internship, as the idea of working with the tax office was alien to me, the breadth of the tasks and projects helped me understand the type of work I would like to pursue after completing my degree. The internship also made me more aware of my strengths and weaknesses in the work environment. My line manager and colleagues were extremely supportive and had arranged a variety of projects for me, allowing me to get a rounded experience of working for the team and I lead a project on the relationship between HMRC and Generation Z, which was extremely rewarding. The planning and structure of the internship programme ensured that I was given the opportunity to make a meaningful contribution and I have enjoyed working in a team to produce the desired quality of work in a timely fashion. I was able to carry forward the teamwork, organisational, and leadership skills into my role as President of Politics Society on campus. I believe myself to have benefited from the programme and will seek to further develop these skills after graduation. The overall experience of working in a large team in a reputable organisation helped me explore my future career opinions. Interning at HMRC has given me greater confidence in my work capabilities, and increased my motivation to pursue a career in the Civil Service. I would recommend the Summer Diversity Internship Programme to anyone who is interested in exploring a career with the Civil Service. There is a range of networking events that allow us to gain a better understanding of the different roles available in government, further allowing us to gain a better understanding of our future career prospects.